Kumamoto Castle is one of Japan’s Three Great Castles that was completed in 1607 after a 7-year construction process by the feudal lord of Higo, Kiyomasa Kato. Beginning with a large castle keep, 49 yagura turrets, 18 turret gates and 29 castle gates were incorporated into the castle grounds which measured about a huge 98ha and had a circumference of 5.3km. 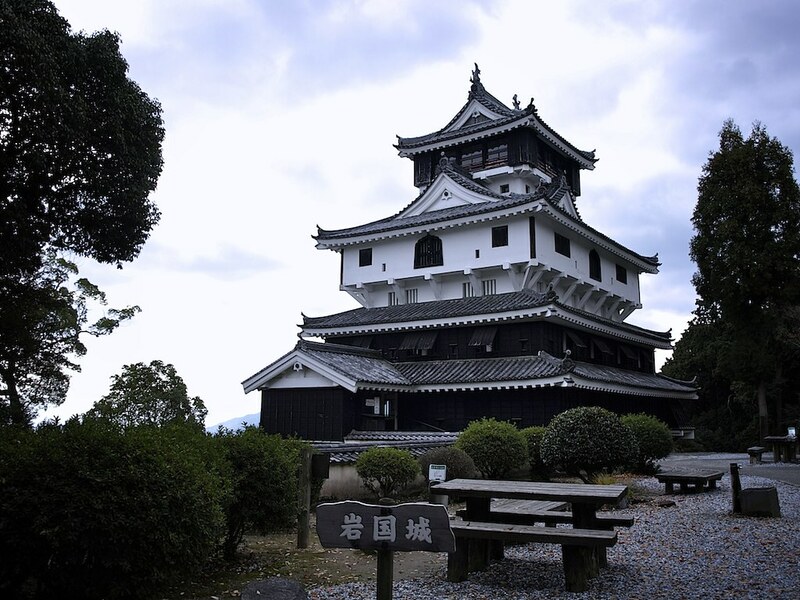 The interior is lush with gingko and camphor trees, and the castle is famous for its beauty with surviving remnants of a castle town all around it. There are 4 gates with which to enter its expansive grounds, but for first-timers, coming in through the main gate of Hohoatego-mon is recommended. There are performers garbed as armored samurai in front of the gate along with volunteer guides. The Udo Yagura is a precious wooden turret that has retained its original structure and has been designated as an Important Cultural Property. One characteristic of the turret is the linear uncurved gables and there is also its 3-layer and 5-story structure which goes all the way underground. The Kuragari (Darkness) Passageway is an underground passageway that goes to the official Honmaru Palace, something that is unusual even in Japan. The stone walls include items that were there right from the time of construction, and even traces of the fire from Seinan War can be glimpsed. The Honmaru Palace which was restored in 2008 had been the core for the castle with facilities such as living quarters and a kitchen for the daimyo (feudal lord), and at the time, it is said that it had as many as 53 rooms. The castle keep was situated on top of the 50m Mt. Chausu, and is a composite complex made of the large keep (3 layers 6 stories with 1 underground floor, 30m) and the small keep (2 layers, 4 stories with 1 underground floor, 19m). Much of the castle had been burned down in war, but it was rebuilt in 1960 so that from the top level of the large keep, a full view can be had of Kumamoto City. The restoration of the keep was faithful down to the numbers and rows of tiles, and it is a deeply aesthetic structure with an underlying tone of black. The interior has weapons and furnishings of generations of Higo daimyo as well as displays of documents of the Seinan War among other exhibits. At the center of Nagoya Castle is its tenshukaku or castle tower which was rebuilt in 1959. The surrounding remains of the castle were made into Meijou Park. At present, the Honmaru palace is continuing restoration. A third of the construction costs, about 5 billion yen, comes from donations from Nagoya citizens. Local residents’ passion is linked into the restoration of Nagoya Castle. Along with the tenshukaku, Honmaru is the most important part of Nagoya Castle. For that part, the front hall and the omotesho-in parlor (a parlor constructed at the front of a building) are open to the public. The front hall is called the Tiger Room, and is the official entrance for visitors who can also use it as a waiting area. On the walls and sliding doors, there are tigers and leopards illustrated to express courage. The omotesho-in was used for the feudal lord and his servants to meet. There are paintings of flowers and birds in the rooms, and there is a profound air. They were the meeting places for the lord and his family as well as venues for dinners. It’s also said that the very first lord had had his wedding ceremony held there. Illustrations of the year-round events are famous. The castle was enlarged after the unification of the nation for lords on the way to the capital. Gorgeous sculptures and metal fittings were added to the Shogun’s chambers, and even within Honmaru Palace, it was the most elegant area. Elsewhere, there are bathrooms and the Kuroki Sho-in which was reputed to be the lodgings for Ieyasu Tokugawa currently scheduled for restoration. Efforts are being made with the citizenry for the care and maintenance of the excellent scenery of Ninomaru Garden, called a place of scenic beauty, a new place for exchange in the area surrounding Nagoya Castle and the reconstruction of the shachihoko golden dolphins. After completion, it will become a huge location for history and culture in the Chubu area. Nijo Castle was constructed in 1603 as the Kyoto lodging place of Tokugawa Ieyasu, who had secured victory in the Battle of Sekigahara. It was later remodeled into the form of Nijo Castlethat is seen today by Iemitsu, the third shogunate. As a flatland castle, the structure was built on a larger plot of land after the territory of thedaimyo had increased. In the spacious castle grounds are Ninomaru Palace (National Treasure), Honmaru Palace (Important Cultural Property), and the Ninomaru Garden (Place of Scenic Beauty). While strolling through the castle premises, we recommend viewing these important buildings and the wall panel paintings in Ninomaru Palace, which is an Important Cultural Property. Kanazawa Mido Hall, which was once a Pure Land Buddhist temple, was invaded and taken over by General Morimasa Sakuma under orders of Nobunaga Oda. Afterwards, building of a castle began from 1583 under Toshiie Maeda, the head of the Kaga clan. However, following the loss of the castle tower from fire due to a lightning strike in 1602, only the watchtower and palace were re-built. But then another fire occurred which led to more re-building without the castle tower ever being resurrected, and even now it (inner citadel) exists only as remains of a demolished site. Currently, Kanazawa Castle is undergoing restorative construction so that it can be passed onto future generations as an important historical cultural property. In 2001, restoration of the Hishi Yagura watchtower, the Gojikken Nagaya warehouse and the Hashizume-mon Tsuzuki Yagura watchtower and command post was completed to become symbols of Kanazawa Castle which boasts an area of 1894.23 sq. meters. These buildings were protection against enemies during war, so there were latticed windows for stone-throwing and guns, mortared walls painted in white, and walls covered in square tiles jointed with raised plaster constructed against fire which were seen everywhere as a protective function. In addition, the Ishikawa-mon Gate and the Sanjikken Nagaya warehouse have been designated as Important Cultural Properties. One attractive point about Kanazawa Castle is its diverse stone walls. Because of the different uses of the stone walls depending on the place and the repeated reconstruction, you can view completely different types of stone wall within the vast grounds so that the castle has also been called a stone wall museum. You can walk and observe at your own pace through the large site and can also tour the adjacent Kenroku-en, one of Japan’s Three Great Gardens, which was also constructed by the same head of the Kaga clan. Hiroshima Castle is a 15-minute walk either from the JR Hiroshima Station or from The Atomic Bomb Dome. The castle was completed in 1589. It is said that a feudal lord during the Warring States period, Terumoto Mori, initiated the construction of the castle after feeling the necessity of having one following a visit to the Osaka Castle upon an invitation from Hideyoshi Toyotomi, a preeminent feudal lord who eventually brought an end to the Warring States period. Though it was designated as a National Treasure in 1931, it was blown out by the atomic bombing in 1945. The tower keep (tenshukaku) was restored completely by the 1958 restoration construction project; however, the exterior is made by concrete. Inside the tower keep is a museum of history that introduces the samurai (buke) culture. The most popular attraction at the museum is the space where visitors can try out wearing samurai clothes and helmets and take pictures freely　without being attended by staff members. The top floor of the castle has an observatory from which a panoramic view of the Hiroshima City can be seen. If the weather is good, you can see the island of Miyajima in the distance. HiroshimaCastle is also known as the castle of carps (Rijyo); many say that this name comes from a geographic name, but some say that the name comes from the fact that in the old days, there were many carps swimming in the moat. Whichever the case may be, today, many carps swim around in the moat. The connected yagura watchtower structures of the ninomarusection–omotegomon gate, waki-yagura, tamon-yagura and taiko-yagura–were restored as wooden structures in 1994; the interior of these structures are open to the public. A gate of sophistication and grace, the pillars of theomotegomon gate are partially made of wood from a thousand years old hinoki tree. The moat and stonewalls remain in the conditions they were at the time of the bombing. 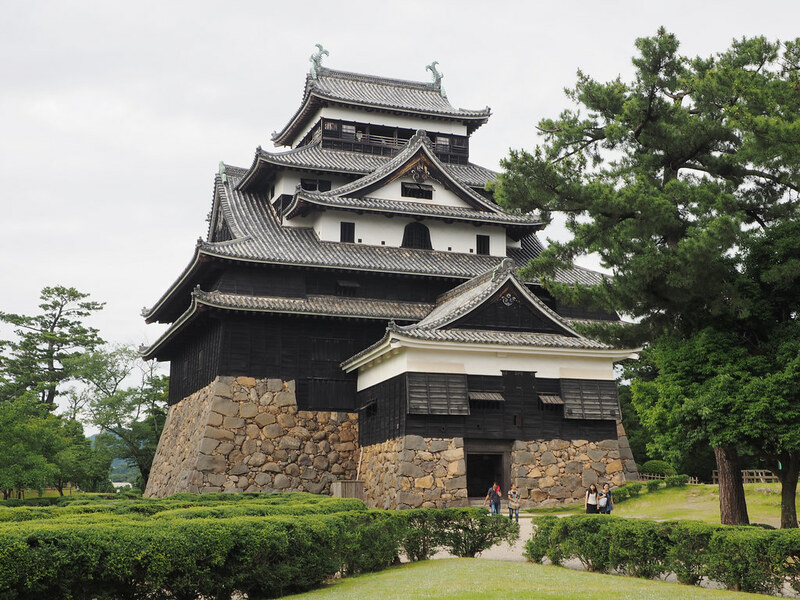 Hiroshima Castle has been selected as one of the 100 great castles of Japan. Also, on the grounds of the castle are a large eucalyptus tree and a willow tree which survived the atomic bombing. At night, the tower keep is lit up; the upside down view of the tower keep reflected on the water of the moat is breathtaking. A castle whose memories of historical figures can be realistically thought about up to now is uncommon. The differences in the reconstruction of some buildings is evident. By no means is it a big castle, but we would like you to come and visit a place that has plenty of memories of the lifestyle of warring commanders. Enter the castle after taking off your shoes. The actual entrance is in the basement, and part of the stone wall is uncovered. The ladder-like stairs are very steep. Along with watching your step, it is also necessary to be careful not to bump your head on the low beams running among the pillars. This was also in consideration of preventing a full attack during an enemy invasion. In addition, there are also ishi-otoshi windows from which to drop stones,tsuke-yagura attached towers to attack from the flank, hidden rooms for soldiers and other Sengoku Era tactics against enemy forces. Currently, there are suits of armor, folding screens and other exhibits on display which are very popular. The highest floor has a 360-degree view. Called the mawari-en, the corridor that encircles the floor is outside the castle which is unusual. Because the wood would rot if snow piled up, construction on cold ground was impossible. At the very least, the wonderful view can make one feel fully like the master of the castle. The surrounding edge goes no higher than one’s knees so it’s not even as tall as a shelf which means there is a thrilling aspect. There is one good point behind the reason for Inuyama Castle avoiding destruction. Whenever it was known that a strong enemy was on the way, there was a quick surrender and no resistance. At any rate, the existence of a castle built over 400 years ago is a valuable experience. Although Osaka Castle has twice been destroyed by fire, Otemon and Sakuramon, which are Important Cultural Properties, still remain, as does the castle tower, which is a registered Tangible Cultural Property. The castle tower, which was rebuilt 266 years after being burned down, is a 55-meter high, five-story (outer), eight-floor (inner) building. This is one of the foremost of the many post-Showa era castle towers, and it boasts an elevator so that elderly people and disabled persons can enjoy it too. One of the features of Osaka Castle is the glittering golden ornamentation, including the golden carp on the roof. Osaka Castle is situated inside OsakaCastle Park. Osaka Castle Park is a huge site of roughly 106 square meters. In addition to OsakaCastle, this park abounds with nature, including Nishinomaru Garden, where there are approximately 300 cherry blossom trees, and the plum grove, which has approximately 1200 plum trees across 100 varieties. Concerts also take place at Osaka Castle Hall, and it is the ideal tourist location for slow walks. The museum in Osaka Castle Tower is where you can learn about the history of Osaka Castle. On the first floor, you can study the life of Toyotomi Hidetoshi and learn about the history of OsakaCastle in the theater room. On the second floor, you will be introduced to general information about the castle by means of panel displays and replicas of the carp and the tiger and other decorations. On the third and fourth floors, items and documents related to Toyotomi Hidetoshi are on display. On floor five, there is a display that includes a folding panel about the siege ofOsaka and the situation at the time, which served as a model for the current Osaka Castle, all of which is available in English. On the seventh floor, there are miniature models that tell the story of Toyotomi Hidetoshi’s life, while the top floor is a viewing area that takes in all of Osaka. After taking in the history from the first to seventh floors, and deepening your understanding of the history of Osaka Castle and the man known as Toyotomi Hidetoshi, the streets of Osaka as viewed from the viewing area will depict a different scene. The ruins of the castle known as Japan’s Macchu Picchu are at the peak of Mt. Gojo in the southern part of the nature-filled Tajima Region in Asago City, Hyogo Prefecture. At an altitude of 353.7m, Mt. Gojo has also been called Torafusujou or Kogajou (Lying Tiger Mountain) since its shape seems to resemble that of a tiger lying down. However, the castle no longer exists with the remains of its stone walls continuing to relate its long history. Even so, one reason behind the ruins’ continuing charm for people even now is the wondrous scenery that has been created from the topography. In the early mornings with their fine sunrises from autumn to winter, when the morning fog which rises from the river deeply enshrouds the mountain, the peak where the ruins of Takeda Castle are located is surrounded by a splendid wide sea of clouds. That scene is exactly like a castle in the sky which has been called Japan’s Macchu Picchu Ruins. There are many unknowns surrounding the history of the castle, but it’s been said that around 1441-1443, the military governor-turned-feudal lord Otagaki constructed Takeda Castle. However during the age of warfare known as the Warring States Era, the castle couldn’t avoid the wartime destruction and ended up facing a number of battles. In 1580, under orders of the shogun Nobunaga Oda, Takeda Castle was invaded and fell, and Otagaki’s influence was ended. Hirohide Akamatsu became the new ruler of the castle and began reconstruction which successfully completed the castle’s expansion. Currently, the castle remains are from what Akamatsu constructed. However, his reign was brief, and in 1600, he was on the losing side at the pivotal Battle of Sekigahara at the end of the Warring States Era and was forced to commit seppuku. Another new ruler was found but afterwards in the new Edo Era, the castle was given the order to be abandoned by the shogunate. Even with its heroic history during the Warring States Era, the castle has remained abandoned among the soaring beautiful mountains. This timeless story has been colored by a beautiful fog of the first order and continues to inspire the hearts of people. Looking up to this mountaintop castle from below, the appearance of floating in the clouds is wonderful, but while climbing the mountain, the scene of river fog covering the mountain road in the distance is also beautiful. As an abandoned castle, the beauty of the view seen from the remaining stone walls further highlights the sad historical evidence. If you are yearning to see this beautiful fog, aim for November and check that the temperature during the day before you go is relatively high as the night cools down, and then head out the next morning. The river going downstream will cool down due to the difference in temperature and the lovely fog will form. Also, in recent years, the area has been recognized as a place for lovers, so it would be a great place to visit with that special someone. However, please note that during winter between December and March, the mountain is closed to entry due to snow. Since the establishment of Hikone Castle in the early Edo Era, it has been one of the few castles in Japan to have retained its beautiful appearance. Among the early modern castles, there are only 12 surviving original castle towers or keeps within the nation, and even within those, Hikone Castle has been selected as a National Treasure. The castle with its massive bearing is built upon the peak of Mt. Hikone as it looks over Shiga and the largest lake in the country, Lake Biwa. The highlights of Hikone Castle are not limited to the castle tower and the watchtower alone. At the north side of the castle, there is Genkyu-en, a Japanese-style garden with a path built around a pond. The garden has been built to recreate The Eight Views of Omi showing the beauty of the former Omi Province (now Shiga Prefecture). During the season of autumn leaves, it is lit up and the surrounding trees beautifully melt into the surface of the large pond that is in the center of the garden. Genkyu-en is a famous garden that will evoke the splendor of Edo culture from that time. Also every September, there is the Mushi no Koe wo Kiku Kai (Celebration of Listening to Insects) and other events where you can fully enjoy Hikone Castle’s co-existence with nature. For 450 years from 1429 to 1879, the Ryukyu Kingdom was a monarchy-based nation in whichShuri Castle was its administrative center. The model for the castle was Shikin-jo Castle in China so it didn’t have a castle tower as was the case in Japanese castles. However, Japanese architectural style could also be seen everywhere such as the gables done in the Karahafu style. With these Chinese and Japanese styles, the distinctive Ryukyuan architecture could be observed which matched the natural features of Okinawa. The castle burned down during the Battle of Okinawa in World War II in 1945, but in 1992, structures such as the main palace were restored. However, only a part of the entire 5ha area is open to the public as the Shuri Castle Park as restoration is taking place to this day. After passing through Houshin-mon Gate, head for Una Garden at the main palace for Shuri Castle. From this point onwards, admission is necessary. Since shoes are prohibited from the South Hall to the main palace, bringing slippers would be handy. The main palace in the center ofShuri Castle looks like a 2-story structure but it is actually a 3-story wooden building. The 1st floor was used by the King for state affairs and formal ceremonies while the 2nd floor was the place for ceremonies involving the King, his family and court ladies. The 3rd floor was an attic for the purposes of air ventilation. When looking out over the main palace from the garden, many dragons can be seen. And even inside on either side of the staircase in the main palace, there are sculptures of 4.1m dragons. These are called the Great Dragon Pillars, and with the dragon as a symbol of the Emperor of which there are no examples even in China, it is a unique Ryukyuan feature. Shurei-mon Gate outside of the castle was built in the middle of the 16th century. This was also burned down in the Battle of Okinawa, but after its restoration in 1958, it has become a symbol for Okinawan tourism. It has a beautiful appearance with its red tiles and its picture was even used on the 2000-yen bill. Beyond that are the stone gates of Sonohyan-utaki which also cannot be missed. Constructed from Ryukyuan limestone, it is a place of worship where the King’s safety was prayed for whenever he left the castle. It is made into the form of gates but it isn’t a structure for people to pass through; instead, it is a place that, in a manner of speaking, is a worship gate for the gods. It has been nationally recognized as an Important Cultural Property and along with what remains of Shuri Castle, is also a World Heritage site. Bicchu Matsuyama Castle which has its origins in the Kamakura Era was restored over 3 years in 1683 with a castle keep that survives today. This place was a strategic point crossing the main east-west road, so during the Sengoku (Warring States) Era, there were violent struggles which resulted in rapid changes in the ownership of the castle. Access by car and bus is only up to the 8th level of the bellows-shaped mountain pass. The next 700 meters involves a 20-minute climb to the top. There are signs on the way to the castle which include boards telling you to “Take it easy and not be hasty” or “Take a breather” so that you can manage your fatigue. The stone walls at the remains of the Otemon Gate are amazing. In addition to the mountain itself being a natural fortress, these walls built on the natural bedrock that is over 10m high made up a famous impregnable castle. The 2-tier 2-floor independent keep is a small-scale structure, but it has plenty of presence atop the elaborate walls. Aside from the keep, the area that includes the Niju yagura turret and the mud wall makes for a castle which is very attractive for features such as the contrast between the white-plastered walls and the black wood paneling, the keep seen against the blue sky, and the bedrock which is enveloped in the fiery vermilion of the autumn trees. Bicchu Matsuyama Castle is also famous as a castle among the sea of clouds. Entering by car at Mt. Gagyuu and heading up to the final destination of Bicchu Matsuyama Observation Point, you can see the sea of clouds from late September to early April in the early morning once the conditions for weather and temperature differences are met. In particular, in the early mornings between late October and early December, you can also anticipate thick fog so the sight of the castle floating above the sea of clouds is popular as a magical spot for taking pictures. The Sengoku (Warring States) Era was a time when it was commonplace for castles to be built on flat land. However, Iwakuni Castle was built at the top of the north end of the 200m mountain ridge that projected out on the large peninsula by the Nishiki River. The river was a natural moat as it encircled the castle in three directions except the south. The mountain castle built in 1608 would be dismantled after a brief 7 years due to the Ikkoku-Ichijo (one castle per province) order given in 1615, but it was rebuilt in 1962. The tour of the castle begins with the view from Kintai Bridge. As you cross the 5 continuous arches of the bridge, and then get on the ropeway from Kikko Park at the foot of the mountain, you reach the top only to find that there are 2 routes to the castle. The wide left route heads for the rear of the castle while the right mountain route heads for the castle tower. By all means, take the mountain route since it will take you to the remnants of the Otemon Gate and the stone wall that will evoke those days which cannot be done if you take the wide route. Both sides of the high wall measure 19.6m in width and the dry moat measures 20m in depth; these two were included as some of the defensive measures for the castle. The top floor was built so that it was larger than the lower floor, a feature that was unusual for the time, and the view from the Southeast Asian-influenced castle tower which omitted the roof in the space between the two floors is refreshing. Head home on the wide route. The huge well known as Ohtsurui which has also been called an emergency exit is a must-see. Kikko Park was once the residence of the feudal lord. On its large grounds, there remain many valuable examples of architecture. Middle-class samurai housing spanning 250 years known as the Mekada Residences have been designated as National Important Cultural Properties. The Kinunkaku was built facing the moat of Kikko Park as a shrine building for votive picture tablets and has the appearance of a Japanese painting. The Kikko Shrine has been similarly designated as an Important Cultural Property and has a main shrine, a front shrine , a shrine gate and other structures that were built in the same time period that are extremely valuable.